London – Iran, Iraq and Turkey have agreed to create a triple military alliance as the first step towards growing cooperation in mutual defense and regional security. The creation of the “military triangle” was highlighted yesterday in a report published by Fars News Agency, the principal news outlet for the Islamic Revolutionary Guard Corps (IRGC). 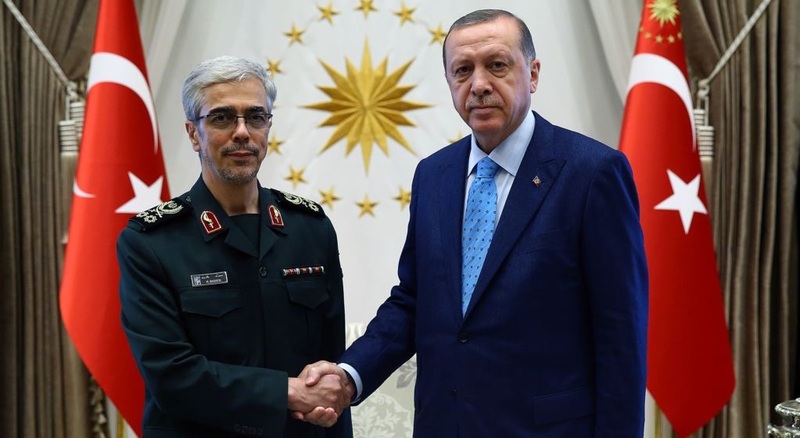 According to the report the idea of alliance was raised in the recent trip to Ankara by Iran’s Chief of Staff of Armed Forces General Muhammad Hussein Baqeri at the head of a 40-man delegation, during high-level meetings with Turkish leaders including President Recep Tayyip Erdogan. Baqeri’s visit was the first of its kind by the highest Islamic Republic military commander to a member-state of the North Atlantic Treaty Organization (NATO). Its historic importance was subsequently highlighted by the visit to Tehran of the Turkish Chief of Staff Gen. Hulusi Akar followed by President Erdogan himself. Within a few days of Baqeri’s visit to Ankara, his Iraqi counterpart Gen. Othman al-Ghanimi came to Tehran to discuss Baghdad’s role in the emerging alliance project. According to sources, Iranian, Iraqi and Turkish senior commanders held a series of meetings to set out the rules for join staff conversation, exchange of military intelligence and targeted joint operations. Since then, the three neighbors have held coordinated military exercises along their respective borders. Initially, the composition of Baqeri’s team in his Ankara visit was kept confidential. Now, however, Fars has revealed the names of some of those who accompanied the Chief of Staff in his historic visit. They included General Muhammad Pakpur, Commander of the Ground Forces of the IRGC, Gen. Qassem Rezai, Commander of the Border Forces and the deputy head of the regular army’s planning division. Gen. Rahim-Zadeh. Also present in Baqeri’s team was Gen. Mehrabi, who heads the Khatam al-Anbia base, a conglomerate that runs the IRGC’s economic and business enterprises, indicating that the “triple alliance” may also include the sale of certain categories of weapons by Iran to Turkey and Iraq, as well as joint construction projects in border areas. The presence in Gen. Baqeri’s team of Gen. Hassan Baqeri, in charge of the army’s training programs, indicated the intention to extend military cooperation into educational and academic domains. The fact that Baqeri also met the Turkish Prime Minister Binali Yildrim, Defense Minister Nurettin Canikli and Security Chief Hakan Fidan underlined the broader political dimensions of his high profile role in reshaping Iran’s defense and foreign policies. The “triple alliance” also envisages cooperation in training of the security forces of the three neighbors. In talks with his Turkish and Iraqi counterparts, Gen. Baqeri proposed the development of plans for academic level “joint action” in the field of defense and security. That could allow for an exchange of students seeking military careers at higher academic levels. Such an exchange would enable Iranian trainee officers to get familiar with the military culture of NATO, something that was available to Iran before the Islamic Revolution in 1979. At the same time, the program would enable the military in Iraq and Turkey to obtain direct understanding of Iran’s military doctrine, mindset, methods and practices. It is not clear how many trainee officers would be exchanged among the three members of the proposed alliance. However, according to Gen. Baqeri the putative allies would also organize joint courses for trainee officers from all three countries. That would allow the gradual emergence of a new generation of officers who have studied together and thus know each other’s way of thinking more closely, fostering an esprit de corps that could strengthen neighborly ties. According to Fars, it was the Kurdish secessionist referendum in Iraq that speeded up a process that had been “in gestation at thought level for some time”. In an unusually frank statement, Gen. Baqeri has asserted that Iran, Iraq and Turkey will not allow Iraqi Kurds to secede. Iran and Turkey have a long history of alliance treaties. The first came in 1639 when the two neighbors divided Mesopotamia on the basis of the Qasr-e-Shirin Treaty, ending centuries of conflict and war over who controls what is now Iraq. That ended centuries of wars between the Ottoman Empire and Iran in which, at times, Iranians allied themselves with European powers against the Turks. After the collapse of the Caliphate in Constantinople, Iran and Turkey went through a period of “national redefinition” and in 1933 concluded the Saadabad Pact which even envisaged the creation of joint military units. That was interrupted in 1941 when the Allies, Great Britain and Russia, invaded and occupied Iran for almost five years. In 1955 Iran and Turkey created a new alliance with Iraq. Known as the Baghdad Pact it also included the United Kingdom. The Baghdad Pact collapsed in 1959 when the new Iraqi pro-Soviet regime of Col. Abdul-Karim Qassem denounced it. That forced Iran and Turkey to create a new alliance known as the Central Treat Organization (CENTO) with Pakistan added as a new member and the UK retaining the place it had in the Baghdad Pact. The United Sates was included as an associate member, emphasizing CENTO’s close ties to NATO. Right now Iran, Iraq and Turkey have a number of major concerns. The Kurdish secessionist bid is highlighted as a major threat. In reality, however, such a threat could be no more than marginal in military-security terms. More urgent is the need to fully cleanse the region from the remnants of ISIS and find a way out of the quagmire that is Syria. Iran and Turkey have been on opposite sides in Syria for seven years. Now, however, Tehran is beginning to realize that it is losing its dominant role in Syria as Russia assumes the role of big power there. An alliance with Turkey and Iraq could help Iran regain part of its lost influence in Syria without risking a direct clash with Russia. The forging of the triple alliance also boosts the prestige and authority of Gen. Baqeri as a top-level player in Iran’s macro-politics, eclipsing that of President Hassan Rouhani and his Cabinet who have been excluded from the entire process. The 56-year old two-star general, whose full surname is Afshordi-Baqeri, took over as Chief of Staff last June and has hit the road running. Holder of a PhD, Baqeri is regarded in Iranian military circles as an intellectual soldier as opposed to his long-serving predecessor Gen. Hassan Firuzababadi, who was more of a bureaucratic figure. Gen. Baqeri has also established direct contact with his Pakistani counterpart Gen. Qamar Javed Bajwa, who is visiting Tehran next week. According to sources Gen. Baqeri wants Pakistan to join the emerging “triple alliance” or, at least, to revive aspects of military cooperation it had with Iran and Turkey before the mullahs seized power in Tehran in 1979. In a gesture of goodwill toward Baqeri, Gen. Bajwa ordered the deployment additional Pakistani military units on the border with Iran to prevent infiltration of “terrorists” and smugglers into Iranian territory. Gen. Baqeri’s message is clear: The IRGC and the Iranian armed forces are really important players in the nation’s politics. Antagonizing them would be bad policy on the part of the US, especially at a time that the new commanders, under Baqeri, are trying to establish links with NATO via Turkey. “Iran has already entered a post-Khamenei transition period,” says Nasser Zamani, an analyst in Tehran. Gen. Baqeri’s efforts to make the “triple alliance” possible is an indication, albeit indirect, that his priority is national security and regional military cooperation rather than “exporting revolution”, a project that has already failed. Amir Taheri was the executive editor-in-chief of the daily Kayhan in Iran from 1972 to 1979. He has worked at or written for innumerable publications, published eleven books, and has been a columnist for Asharq Al-Awsat since 1987. Mr. Taheri has won several prizes for his journalism, and in 2012 was named International Journalist of the Year by the British Society of Editors and the Foreign Press Association in the annual British Media Awards.